(PhysOrg.com) -- A spiders silk is strong and more elastic and has a large range of possible medical applications. However, spiders have a history of being territorial and prone to cannibalism, so the idea of having a large population to produce commercial amounts of silk is not possible. However, silk worms have been producing their silk commercially for some time. It was this idea that led Professor Don Jarvis from the University of Wyoming to develop a way to genetically modify the silkworm to spin silk with spider protein. The results of this recent research have been published in the Proceedings of the National Academy of Sciences. These new genetically modified silkworms are able to produce composite fibers that contain silk threads from both the spider and the silk worm. On average, these fibers have proven stronger than the fibers produced by either the silkworm or the spider. This could possible open the door for large scale production and the use of these fibers in many different medical applications. Possible applications include artificial ligaments and tendons, tissue scaffolds and new biomaterials for wound dressing. The fibers are also strong enough that they could provide a possible new material to be used in bulletproof jackets and vests. In order to make this happen, the researchers transferred the key spider genes responsible for the thread making into the silkworm. 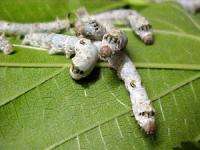 Given that silkworms are capable of creating mile-long threads in their cocoons, they provide a way to greatly increase the stronger threads. This is not the first time that researchers have tried to create genetically modified spider alternatives. Synthetic spider genes have been placed into bacteria, animals and plants. However, none of these were able to produce enough pure silk protein needed for commercial production. The successful use of the silkworm may prove to finally be the solution they have been looking for. I can't wait for them to make an artificial ligament for my tool so that I can have the real one cut and attached to the fake one. Now they should see if they can get different colored silks. That would make an interesting small business, raising GM silkworms. You guys see this article about using electrical fields on silkworms ? yeah, and maybe they can get them to spin carbon nanotubes...just kidding. I like this idea. It's about time they engineered silk worms to produce spider silk. Imagine the amount of potential this could provide.